BIRDscapes Gallery Glandford – Good News! 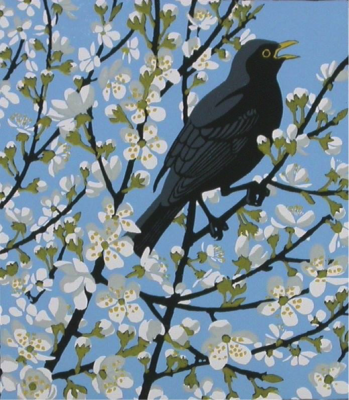 Blackthorn Blackbird a linocut print by Robert Gillmor. I was delighted to receive the email below from BIRDscapes Gallery at Glandford near Holt. This is one of my favourite North Norfolk galleries and one that I visit often. Tea and cake in the Art Cafe next door and afterwards a visit to BIRDscapes – a great way to enhance an afternoon! Firstly, you may have heard that we were planning to sell the gallery. We hope you will be pleased to know that, due to changed circumstances and the current success of BIRDscapes, we have changed our minds. Instead, Emma our daughter will be working with us, son Peter will have an expanded role, while Gallery Assistant, Julie, will be helping out two days a week. We will primarily be in the gallery at weekends. Consequently, we are starting off 2016 with renewed enthusiasm! Our first exhibition opens at 12:00 midday on Saturday February 13th 2016. To see the invitation please click here, and please remember that we will be closed for re-hanging the day before, Friday 12th. We look forward to welcoming you with the usual drinks and nibbles.